The original name of the local fraternity that became the Tau Chapter of Alpha Gamma Rho was Beta Sigma Alpha Fraternity, and had its beginning on December 5, 1921. 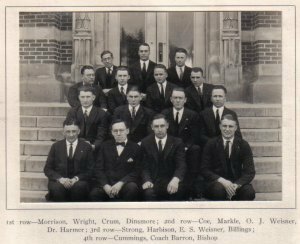 Mr. E. B. Hill, Assistant to the Dean of Agriculture at Michigan Agricultural College, and Mr. H. F. Wilson, Field Secretary of the Alpha Gamma Rho, selected seven students of agriculture as a nucleus of a new fraternity that would later become Tau Chapter of Alpha Gamma Rho. Coach A. M. Barron, Gamma Chapter, and Doctor Paul Harmer, Lambda Chapter. Under the guidance of Coach Barron and Dr. Harmer, Beta Sigma Alpha quickly grew to a membership of fifteen students whose aims were directed exclusively toward agricultural pursuits.